There have been 4 weak explosions ejecting ash plumes of about 4-500 m height during 27-28 Oct. Rumblings were heard with degassing sounds similar to a turbine engine lasting about 1 minute. The lava flow towards the Ash Canyon was about 400 m long and produced incandescent blocks tumbling to the vegetation line. Activity remains mainly effusive with the lava flow about 600 m long. Only few weak explosions occurred during 26-27 Oct.
Explosive activity is increasing in favor of effusive. Since yesterday, there have been 13 weak to moderate explosions with ash rising up to 1000 m. The lava flow towards the Ash Canyon is still active and now 400 m long. The lava flow is decreasing and now only 600 m long. As effusive activity weakens, more explosions seem to occur. INSIVUMEH counted 6 weak events during 22-23 Oct with ash plumes rising about 500 m.
8 weak explosions were recorded during 21-22 Oct. 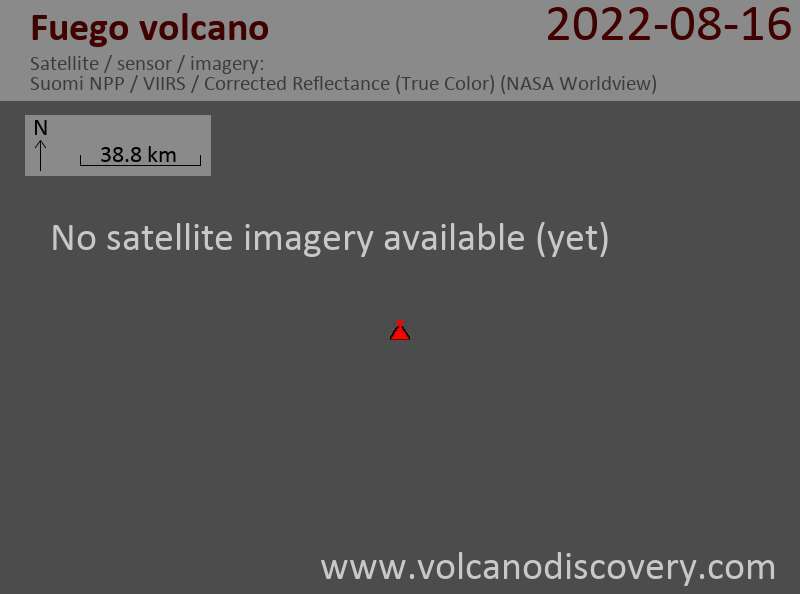 The active lava flow is 800 m long. No explosions were observed since yesterday, but the lava flow towards the Ash Canyon has now a length of 800 meters and blocks tumble down to the vegetation line. Only weak explosions were observed during the past days at Fuego whose activity remains mostly effusive, feeding the active lava flow towards the Ash Canyon now 600 m long. Incandescent blocks detach from its front and roll to the vegetation. Only 3 weak explosions occurred during 14-15 Oct with ash plumes rising 400 m, but the lava flow towards the Ash Canyon is now 600 m long according to the latest update of INSIVUMEH. Explosive activity has decreased in favor of effusion of a lava flow from the summit area, now reaching about 200 m length towards the Ash Canyon. The lava flow has advanced a bit and is now 150 m long, while the strength of explosions has been lower than during most previous days. Ash clouds rose 300-600 m and incandescent pulses were only up to 75 m high. 12 explosions occurred during the last 24 hours with ash plumes rising 600-1400 m above the crater, reaching up to 5,000 f altitude and drifting up to 10 km to the S and SW. 8 rumbling were heard and shock waves that rattled windows in houses of nearby villages. 15 weak to moderate explosions with ash plumes to heights of 600 to 1000 above the crater and incandescent pulses reaching 200 m height were observed. Rumblings were heard and shock waves felt in up to 15 km distance. 9 explosions occurred between 1-2 Oct with ash plumes of 700-1100 m height. Incandescent material was seen ejected to 200 m above the crater, generating avalanches up to 500 m long in the direction of the Santa Teresa valley. There have been 16 explosions between 28-29 Sep including 10 moderately strong ones with ash plumes rising 600-900 meters above the crater. Glowinb bombs were seen reaching 200 m height and generating avalanches around the crater. Fine ash fall was recorded at ​​the observatory, in Morelia and Santa Sophia and Sangre de Christo. Rumblings and shock waves from the explosions could be head and felt in up to 15 km distance. A large lahar traveled through the Ash Canyon (Barranco Ceniza) towards the community of Osnuna on 27 Sep between 14.30-15:50. More than 55 m of rainfall during a single hour (2.2 inches) remobilized still hot pyroclastic flow deposits from the 13 Sep eruption in the canyon including large tree fragments and boulders more than 1.5 meters in diameter. The lahar, strongly smelling of sulfur, cut the dirt road between San Andrés Osuna and Siquinalá. It was the first of these dimensions, but INSIVUMEH warns that more are possible. Activity remains stable. Strombolian bursts reaching average heights of 75 - 150 meters above the crater, 14 explosions total observed between 26-27 Sep (9 weak and 5 moderate) with ash plumes of 500-800 m height above the crater. In the last 24 hours between 24-25 Sep, Fuego's activity increased a bit. The volcano had 13 explosions, some of which could be heard in 6 km distance. Incandescent material was thrown up to 100-150 m above the crater and ash plumes reached 300-800 m height and drifted up to 10 km to the north and northeast, INSIVUMEH reported in the last bulletin yesterday. Activity remains moderate to low with 8 explosions registered over the past 24 hours, 6 weak and 2 moderate ones sending small ash plumes up to 700 m above the crater. Incandescent bombs reach 75 m above the crater and produce small avalanches towards Taniluya and Ash canyons. Activity has decreased at Fuego volcano. In its latest report from this morning, INSIVUMEH writes that there were only 5 weak and one moderate explosions over 24 hours, with small ash plumes up to 300-600 m height and ejections of incandescent bombs to 75 m above the crater. Small avalanches of blocks were triggered towards the Taniluya and Ash canyons and there was faint rumbling audible. Fuego continues its typical activity at moderate levels, with sporadic explosions ejecting bombs to 200 m and ash plumes up to 1 km height. Shock waves and rumblings accompany the larger explosions, and incandescent material falling back generates small avalanches of 500-800 m length on the steep upper slopes. There have been weak to moderate explosions generating ash plumes rising 800-1000 m accompanied by shock waves. Glowing bombs reached a height of 200 m above the crater. The explosions triggered moderate avalanches from the crater rim and incandescent material rolled down for 500-1000 m on the sloped. Sporadic explosions with ash plumes of 500-900 meters above the crater were reported and some of them had rumbling noises and felt shock waves. No lava flows. INSIVUMEH reports weak and some moderate explosions with fine ash plumes rising to 400 to 800 meters, moving at 8 km west, and creating light ash fall in the areas of Sangre de Christo, Panimache I and II to the west. The explosions were sometimes accompanied by rumbling sounds. The lava flows have now disappeared. Activity remains at normal levels with sporadic weak to moderate explosions with ash rising 400-800 meters and some rumbling sounds. The lava flow to the Taniluya canyon has apparently decreased a lot, as INSIVUMEH reported it to be only 50 m long yesterday. The lava flows still remain active on the south and southwest flank of the volcano towards Ash Canyon and Taniluya Canyon, but have decreased to a length of 200 meters and might stop completely during the night. According to information obtained by observers nearby and security forces positioned in Morelia Panimache, one lava flow is traveling down the Ceniza canyon (SSW flank), and another towards the ravine Las Lajas and into Barranca El Jute (SE flank) where it is threatening to cut roads. Fuego volcano's activity further increased after 03:25 local time on 13 Sep, and culminated in violent explosive activity with medium-sizes pyroclastic flows running down its slopes (mainly through Ceniza Canyon), INSIVUMEH reports. Thousands (some sources speak of up to 33,000) of people living in communities near the volcano were asked by the authorities to evacuate their homes. The lava flow continues to be active and about 100-150 meters long, generating block avalanches into the Taniluyá, Ceniza and Las Lajas canyons. There is now continuous ash emission accompanied by moderate locomotive-like sounds and weak shock waves that rattled windows in nearby villages. Ash plumes are rising 3 km above the crater and ash fall occurred in Panimaché I, Morelia and Santa Sofía, and later in Sangre de Cristo and Yepocapa, and as far as Santiago Atitlán, San Lucas Tolimán, Santa Lucia Cotzumalguapa, and parts of Mazatenango and Retalhuleu. Seismicity increased on 3 September. During 3-4 September constant Strombolian explosions generated ash plumes that rose 900 m above the crater and drifted 8 km S and SW. The eruption was heard in areas 10 km away and vibrated structures in Panimaché (8 km SW), Morelia (8 km SW), and Santa Sofia (12 km SE). Lava was ejected 100 m high and spilled over the crater rim. This paroxysm has been the shortest during the past 5 years. It produced large lava and pyroclastic flows into the Las Lajas canyon where it can be remobilized as lahars, in particular as we are in the wettest period of the year. At the moment there are two lava flows towards the canyons Taniluya and ash reaching 600 and 800 meters length, producing constant block avalanches that reach vegetation. On the southeast flank, there is a third lava flow toward the canyon Las Lajas.